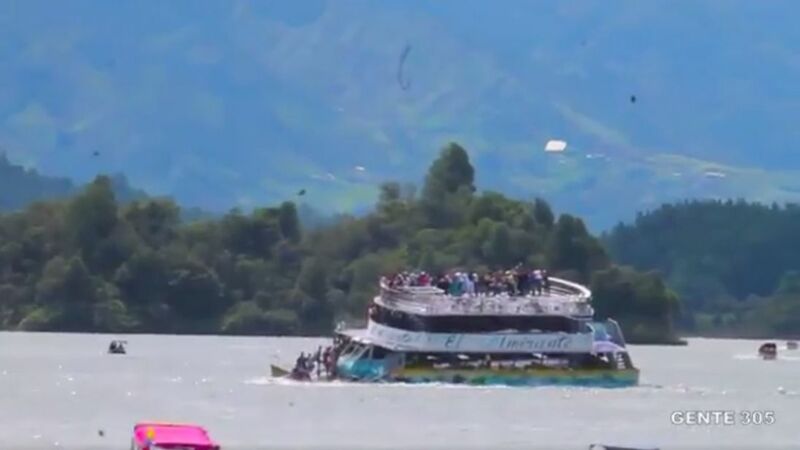 A boat carrying around 170 tourists has sunk in a reservoir in northwestern Colombia. The accident on the Penol reservoir near the town of Guatape, which is approximately 45km east of Colombia's second largest city of Medellin, has left at least six people dead and 28 others missing. The head of disaster relief for Antioquia province, Margarita Moncada, said: "At the moment we have nine people found dead. Another 99 people were rescued immediately and 40 more got out on their own." President Juan Manuel Santos and the mayor of Medellin said emergency services, scuba divers and the air force were involved in a major rescue operation. It is not yet clear where the tourists were from or what caused the accident. Images on social media showed smaller boats rushing towards the sinking ferry. Local media has reported interviews with survivors who claimed that the boat, named El Almirante (The Admiral), appeared to be overloaded. They said they heard a loud noise before the boat began to sink and claimed passengers were not wearing life jackets.